Aspetto was featured in Bloomberg Business on March 8, 2016. In 2000, John Adrain ran into a problem common among San Francisco residents: He had too much stuff and too little space. But Adrain’s stuff wasn’t the kind you shove in storage—an antique firearms collector since he was nine years old, he wanted to keep his extensive (and expensive) gun collection out of the wrong hands. Adrain built a gun safe into his bed, creating the first prototype of what is sold today as the BedBunker by his company, Heracles Research Corporation. The beds not only hide firearms but also protect you from them: They are bullet-resistant. Today, the Texas company offers a full range of concealed safes: BedBunker, CouchBunker, TableBunker, ClosetBunker, and even TruckBunker and ConsoleBunker. The sofas, which range in price from $7,780 to $10,720, are made from fabric that can stop a bullet. Heracles is one of several companies that have begun making bullet-resistant home goods in recent years. Five years ago, Arizona's Ballistic Furniture Systems Inc. began designing bullet-resistant materials that can be manufactured into furniture. In the past year, two smaller companies, Aspetto and Osdin Shield, launched lines of bullet-resistant furniture. Bullet-resistant housewares can sell for double the price of traditional furniture. Osdin Shield's custom-built sofas cost up to $9,000. The high price of his Heracles sofas reflects its customer base: “I don’t have any homeless customers. It tends to be the 1 percent,” said Adrain. Manufacturers test their bullet-proof furnishings in controlled environments, but little is known about how owners would use them in an active shooting. “I don’t know if anyone has had to use them,” Adrain said. Heracles sofa cushions are designed with handles and light enough to lift, so that they can be used as a shield. Interest in Adrain’s array of products is up, he said, and corresponds with a growing national interest in buying guns. Federal Bureau of Investigation background checks—a proxy for gun sales—rose 38 percent in December 2015 over the previous year. "People are concerned about the Second Amendment. When people buy more guns, they buy more safes," he said. 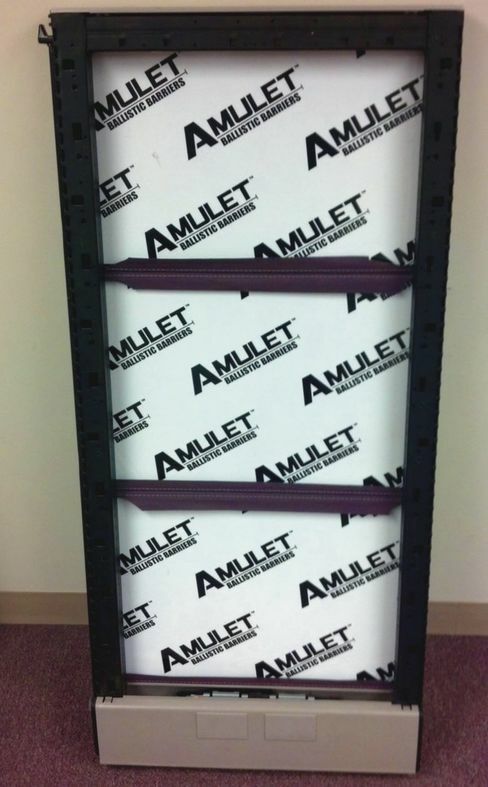 A ballistic barrier from Ballistic Furniture Systems Inc. Source: Ballistic Furniture Systems Inc. Sales of ballistic barriers doubled from 2014 to 2015 for Ballistic Furniture Systems, said its chief executive officer, Jeffrey A. Isquith. The five-year-old company mainly works with commercial clients, such as hospitals, retailers, and hotels, but has started receiving requests to outfit safe rooms in residential homes. Converting a 400-square-foot room to a fully bullet-resistant space would cost $5,000 to $10,000, Isquith estimated. Isquith credits the company’s growth to a successful marriage between ballistic expertise and design savvy: “No one wants everything to look like a bank. They don’t want it to look like a war zone—they want it to be a very nice environment, where you don’t know it's there.” The company designs its ballistic barrier to be easily integrated into a variety of design styles. The client base for bullet-resistant furniture is difficult to pin down, in part because, as Adrain put it, “People who need this kind of protection don’t usually spread it around by word of mouth.” Abbas Haider, founder of the Virginia personal protection company Aspetto, expects interest in bullet-resistant furniture to rise from the political arena. “There’s a lot of heat these days in politics, especially as people pick up arms and enter government buildings,” Haider said, referring to the recent occupation of a federal wildlife refuge in Oregon. Aspetto recently made a $5,000 bulletproof executive desk for a client whose identity even Aspetto’s executives didn't know.